Harry David Brecheen (October 14, 1914 – January 17, 2004), nicknamed "The Cat," was an American left-handed pitcher in Major League Baseball who played most of his career for the St. Louis Cardinals. In the late 1940s he was among the team's stars, becoming the first left-hander ever to win three games in a single World Series in 1946 and later leading the National League in several categories in 1948. 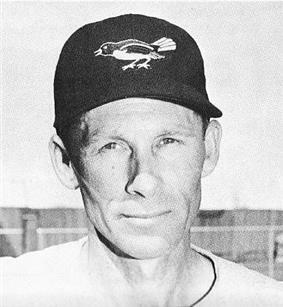 ^ a b c d e f "HARRY BRECHEEN; WON 3 GAMES IN 1946 SERIES AGAINST SOX". The Boston Globe (Associated Press). January 19, 2004. Retrieved 3 April 2014.